On my third Capri Sun, the hubster told me that perhaps I should pace myself. Pace myself? At a children's birthday party surrounded by bossy toddlers, an Elmo soundtrack on repeat, and a balloon guy that insisted on forcing everyone to wear balloon crowns? Pace myself? He was lucky I hadn't carted off the cooler carrying all the Capri Suns. You thought it was challenging being a non-drinker at an adult event? Try being a non-drinker at a children's birthday party. It's 90 degrees out, there are at least six kids competing to see who can cry the loudest, and you just sat on a piece of cake that someone kindly left on your chair. There's a reason why the cooler holding the Capri Suns for the little people is right next to an even bigger cooler holding the bottles of craft beers for the parents. The parents hosting the birthdays have figured out that it's the only way to make sure the other parents don't go insane singing thirty rounds of Itsy Bitsy Spider. And if you're not a drinker, Capri Sun it is. We're planning a few kid-friendly summer soirees of our own and I really want to add a few non-alcoholic drinks in the mix because in all honesty, a girl can only drink so many Capri Suns. In fact, I've made it my mission to create a fizzy and fruity signature summer mocktail (wait, are people still using the term mocktail?). The good folks at Oxo came to the rescue by sending an entire box of summer fruit tools. I know, I know. The rational, reasonable cook in you is scoffing because you don't need fruit tools. You have a kitchen knife and a can-do spirit. You don't need a separate tool to pit cherries. Pssh, you're fully capable of eating cherries and spitting out the pit as you go. Except when you're making cherry pie. It doesn't work so well to stick the cherries in your mouth and spit them back out. People don't like that. So get a cherry pitter. Your friends will thank you for it. Same thing with the mango splitter. You think you don't need one but man, are you wrong. 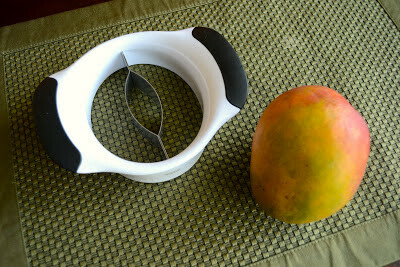 It's a strange little contraption that lets you cut a mango in ten seconds flat. Okay, maybe not ten seconds but it certainly makes cutting mangoes so much easier. So easy in fact, you can eat an entire bowl of mango cubes while you contemplate your signature mocktail (yup, don't care if people aren't using that term anymore. I'm still using it!). And what says summer more than lemonade? Sparkling lemonade? With mango? 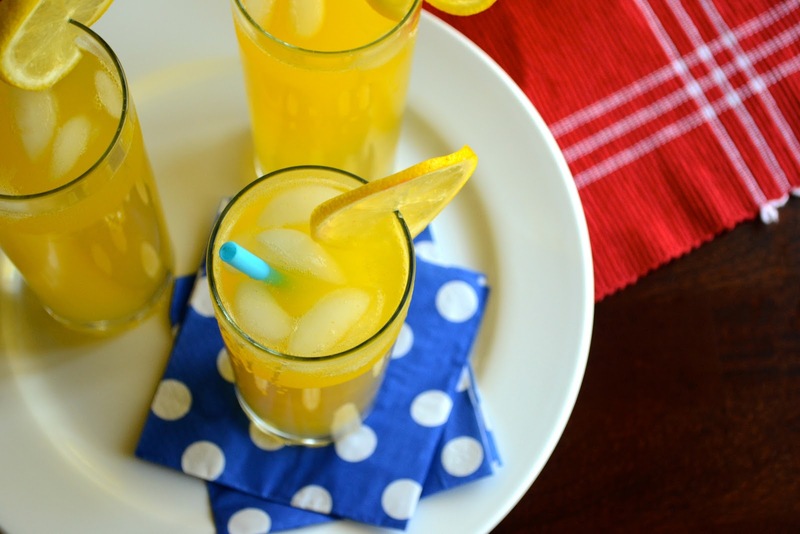 Yup, sparkling mango lemonade. It's perfect for all summer parties, including children's birthday parties. It tastes so good, you'll wish you were invited to more children's birthday parties. Feel free to add alcohol to this drink. I'm not sure it will make singing thirty rounds of the Itsy Bitsy Spider while wearing a balloon crown any easier but at least you can say you tried. 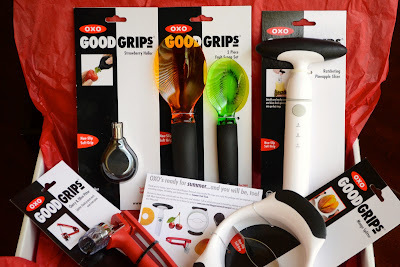 Disclosure: Oxo provided me with a bunch of nifty fruit tools for review purposes. I did not receive any other compensation and was not obligated to post a review. All opinions are my own (obvs!). To make your simple syrup, add sugar and flat water to a pan and boil until sugar is dissolved. Allow syrup to cool (syrup will keep in the fridge for a few weeks and is perfect for making all summer drinks with the exception of Capri Sun which is likely just diluted simple syrup). In the meantime, puree mango cubes in blender. 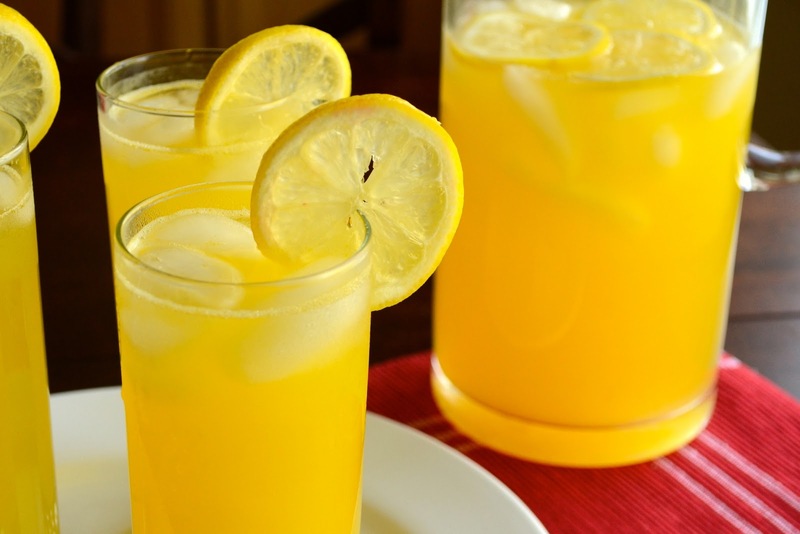 Combine mango puree with lemon juice. Mix in one tablespoon of simple syrup at a time, to taste. Pour mango and lemon mixture into a tall pitcher and top with sparkling water and ice. If you're feeling particularly fancy, you can throw in some sliced lemons and mango cubes. Love anything mango, this looks too good! Those are the perfect recipes I'm always searching for in the summer, thank you ! I sympathize with you, and love the look of this awesome sparkling lemonade. I think it would get me through any party! Oh, and I totally use "mocktail" all the time. Have a great week, Azmina! I'm always on the lookout for good non-alcoholic drinks and this looks divine! And I got the OXO tools, too - how awesome were they?! You're absolutely right, a mango splitter will help tremendously when you're trying to craft delicious drinks such as this. Another important tool that I would recommend is a durable knife sharpening kit to help keep your knives, tools and kitchen blades sharpened. You definitely don't think you need one until you try it on your tools. You'll simply never look back!